Adding a curved shower rod to your bathroom is an inexpensive way to add space and style to your bathroom. Whether you are looking for a little extra elbow room in your tub or a complement to go along with your new step through shower; the curved shower rod is a perfect solution. The curve of the shower rod keeps floors dry by curving in at the corners. As a result, this keeps the curtain in the tub and water from leaking out. This also keeps walls dry and damage free. The curved shower rod gives you increased comfort by creating additional elbow room and showering space. Therefore, the curve of the shower rod increases showering space by up to 9″. 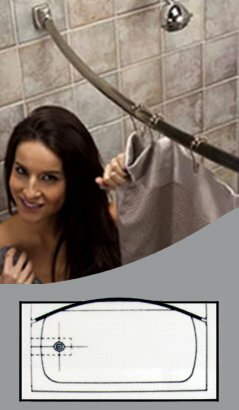 The oval circumference of the shower rod prevents the curtain from spinning on the rod. In addition, no special shower curtain required is required. Simply use standard shower curtains. The design of the curved shower rod fits beautifully with a standard bathtub. The bracket allows for adjustments for any size opening of a standard 5′ tub. Or you can easily make modifications to the shower rod for tubs smaller than 5′. The 6′ curved rod provides a perfect fit for tubs larger than 5′. Oval bathtubs benefit most of all. Since the curve of the shower rod fits the curve of the oval tub you gain the use of the added space and comfort the oval tub was designed for. Our curved shower rod comes with everything you need for installation. We include the hardware, mounting brackets and step by step instructions. We offer 2 sizes and 5 possible finishes. The 5′ curved shower rod is available in either a Stainless, Polished Brass, Brushed Nickel, White, or Oil Rubbed Bronze finish. The 6′ curved shower rod is available in either Stainless Steel, Brushed Nickel or White.